ENNIS, Texas (Oct. 8, 2018) — Reigning Funny Car world champion Robert Hight raced to his 45th career victory, fourth of the season and fourth at the AAA Texas NHRA FallNationals. 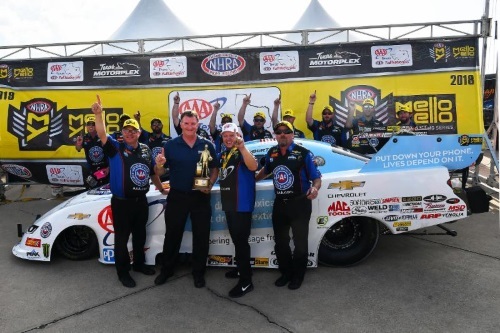 The victory comes after a fiery win in St. Louis that sent Hight to the hospital with a broken collarbone, on which he had surgery nine days before qualifying at the Texas Motorplex. The win is something special for several reasons. For one, Hight didn’t get to celebrate the win in St. Louis with his team, who had a busy off weekend building a brand-new car for the champ. Second, both the races in St. Louis and this weekend are AAA sponsored events and Tom McKernan with Auto Club, was instrumental in getting Hight into USC Medical Center to get a second opinion on his injury and in each of his championship seasons (2009, 2017) Hight has had a victory at Texas Motorplex. With a titanium plate keeping his collarbone together, the Funny Car points leader entered race day as the No. 6 qualifier facing Jim Campbell in the first round. Hight ran quickest of the session with his 3.942-second pass at 320.05 mph. Hight would have lane choice over Tim Wilkerson in the second round. The two-time champion out ran the veteran racer with a 3.954 to Wilkerson’s 3.990. The semi-finals found Hight lined up with rival Bob Tasca III. His solid second-round pass again gave him lane choice. Hight defeated Tasca handedly running 3.962-seconds at 316.75 mph while Tasca got into trouble mid track and had to get off the throttle. The round win landed Hight in his seventh final round of the season, 71st of his career. No matter the outcome of the race, Hight would leave the weekend with the points lead, but it would be either by 10 or 50 points since his finals opponent was J.R. Todd, who sits second in points. It was an epic victory for Hight, who let his emotions show at the top end of the race track. 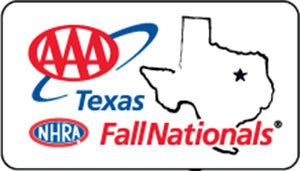 Hight and J.R. Todd put on a great side-by-side show but it was the AAA Texas team who prevailed. The end distracted driving schemed Chevy Camaro had a stellar 3.955-second pass at 325.69 mph to Todd’s 3.984 at 319.52. The PEAK Motor Oil and Coolant Chevrolet Camaro rolled into the first round of eliminations with a monster match-up, John Force versus long-time nemesis Ron Capps. Force was giving up lane choice as the lower qualified car but any perceived disadvantage was erased by Force’s will to win and his goal of keeping his championship hopes alive. 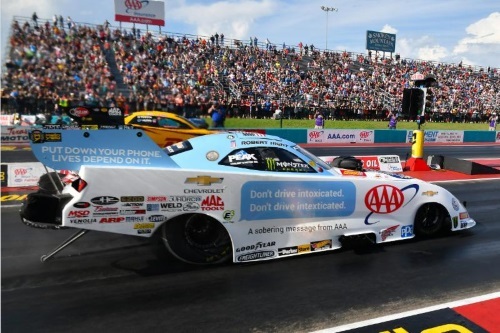 Both Funny Cars left the starting line together and while Force was slightly behind for the first 300 feet by half-track the legendary driver was pulling away for the first-round victory with a winning elapsed time of 3.986 to Capps’ slower 4.024. The win was the 16-time champion’s 58 round win over Capps and propelled Force to a second-round race with Bob Tasca III. In the second round, as the race cars inched into the staging beams some gamesmanship ensued as both 10,000 horse-powered Funny Cars stopped just short of fully staging. Eventually both drivers staged and while Force cut an impressive .039 reaction time Tasca’s near-psychic .007 was enough of a guess to give the non-Countdown qualified driver a slim margin of victory at the finish line. 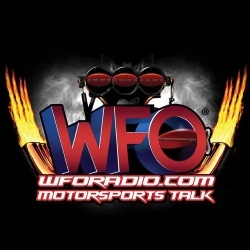 Force posted a decent 4.000 second run at 325.77 in the heat and will head to Charlotte with three races left to secure unprecedented 17th Mello Yello Funny Car world championship. 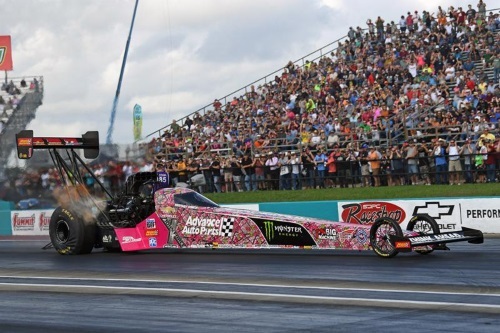 After a solid qualifying effort, Brittany Force and her TrueTimber pink camo decked out Advance Auto Parts Monster Energy dragster team made a stout 3.762-second pass at 330.07 mph to defeat Scott Palmer in the first round of the FallNationals. The speed stood up as quickest of the entire event. Facing Terry McMillen in round two, Force had to pedal her way to the finish line. The 4.334-second pass at 227.69 mph wasn’t enough to take down McMillen who had a clean 3.819 pass at 320.81 mph. 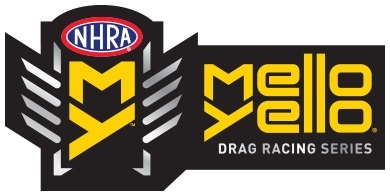 Force will remain ninth at the midway point of the NHRA Countdown to the Championship but their first round pass combined with two solid qualifying passes, gave the team, who spent the off weekend front halving their dragster, some added confidence heading into the second half of the Countdown. 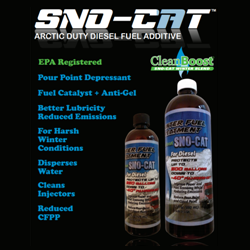 “Overall big improvements for our Advance Auto Parts team. We qualified No. 5 and we made three good runs. Even with those adjustments we are still trying to figure this car out. I think we will be looking good in Charlotte. We will have cooler conditions and I have a lot of confidence,” Force said. 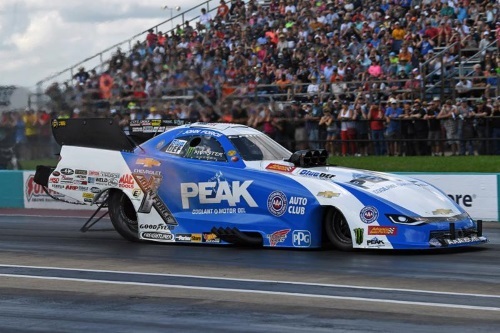 Courtney Force will head to the NHRA Carolina Nationals at zMAX Dragway in Charlotte fifth in the points standings after an early exit at the AAA Texas NHRA FallNationals. 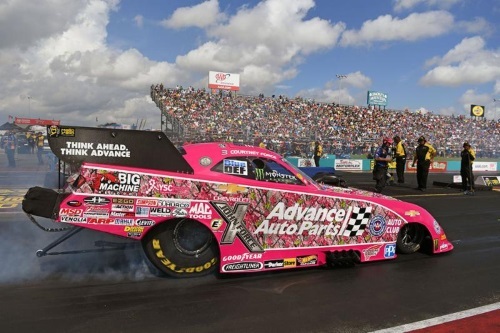 The Advance Auto Parts team, wearing the TrueTimber pink camo in recognition of Breast Cancer Awareness month, had their best run of the weekend in the first round. They laid down a 3.985-second pass at 318.17 mph after the team battled down to the wire in order to fix a mechanical problem. It was an unlucky matchup as Jack Beckman raced to 3.969-seconds at 317.27 mph. Co-crew chief for Force, Brian Corradi, shares Force’s sentiments. The Countdown to the Championship continues with the NHRA Carolina Nationals at zMAX Dragway on Oct. 12-14. Top Fuel: Steve Torrence, Kilgore, Texas, Capco Contractors, 3.786, 325.92 mph def. Terry McMillen, Elkhart, Ind., Amalia Oil dragster, 3.826, 321.04 mph. Funny Car: Robert Hight, Yorba Linda, Calif., AAA Texas Chevrolet Camaro, 3.955, 325.69 mph def. J.R. Todd, Indianapolis, Ind., DHL Toyota Camry, 3.984, 319.52 mph. Pro Stock: Tanner Gray, Mooresville, NC, Gray Motorsports Chevrolet Camaro, 6.622, 207.62 mph def. Jeg Coughlin Jr., Delaware, Oh., JEGS Chevrolet Camaro, 6.636, 207.82 mph. Pro Stock Motorcycle: LE Tonglet, Metairie, La., Nitrofish Suzuki, 6.892, 194.80 mph def. Jerry Savoie, Cut Off, La., White Alligator Racing Suzuki, 6.907, 193.88 mph.